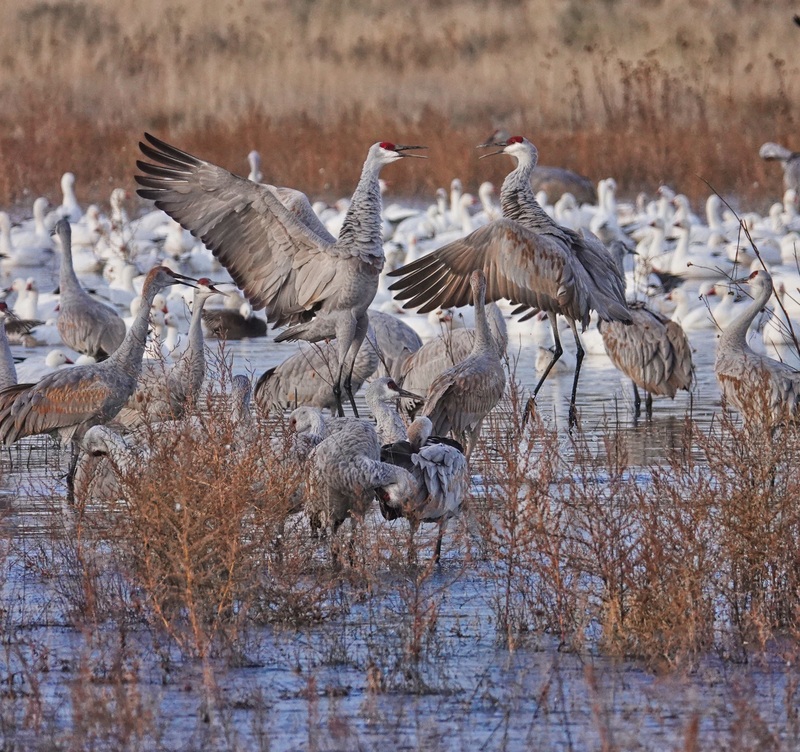 It has been one of the most spectacular weeks in memory at Bosque del Apache National Wildlife Refuge and the Festival of the Cranes in Socorro, New Mexico. The birds are in and close, the light has been simply wonderful (even by NM standards, which is saying a lot), and there is a lot of action in the flocks. 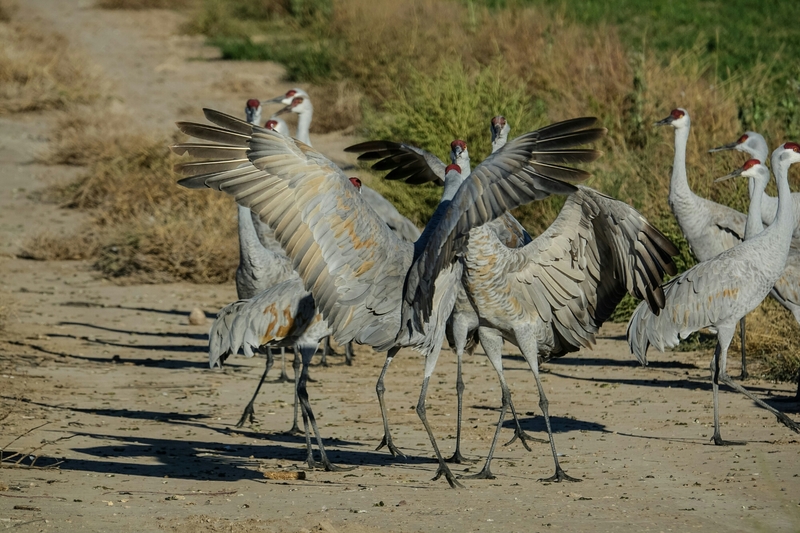 This “dance” is part of the year long mating ritual, and it is a behavior you will see if you spend any time watching cranes. Sony RX10iv in my customized Birds in Flight adaptation of Program Mode. Processed in Polarr. I have lots of images of Sandhill Cranes landing at Bosque del Apache National Wildlife Refuge on the Rio Grande River, south of Socorro, New Mexico, but considerably fewer of Cranes taking off. Unless you can catch the whole sequence, which is interesting, there is way less drama in the take off. 🙂 This is such a sequence, done up into a collage in PhotoTangler on my Android tablet. It goes top left to right, and than bottom left to right, if that is not obvious.As you can see, the Crane runs a few steps before launch…or this one did. I have also seen them leap directly into the air where the water is a bit deeper. 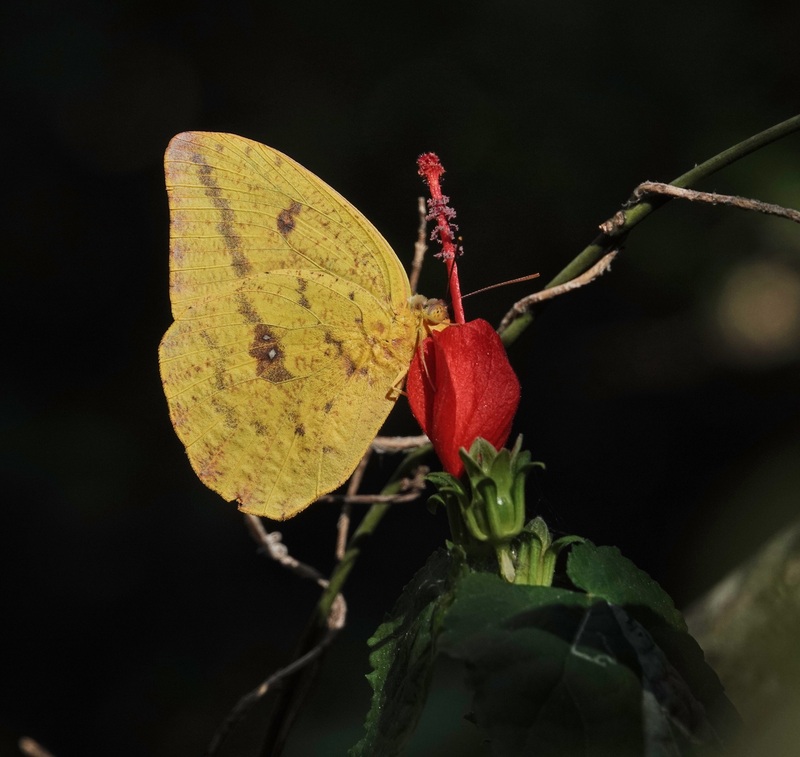 Sony RX10iii at 600mm equivalent field of view. My custom Birds in Flight Mode. 1/1000th @ f5 @ ISO 100. Processed in Snapseed on my Android tablet. Assembled in PhotoTangler. Snow and Ross’ Geese rising from Flight Deck Pond, just moments after I first turned onto the Tour Loop at Bosque del Apache National Wildlife Refuge in Socorro New Mexico last week. Sony RX10iii at 92mm equivalent field of view. 1/1000th @ ISO 100 @ f6.3 (Program Mode). Processed in PhotoShop Express on my Android tablet. Bosque del Apache National Wildlife Refuge is an ideal place to practice action wildlife photography. 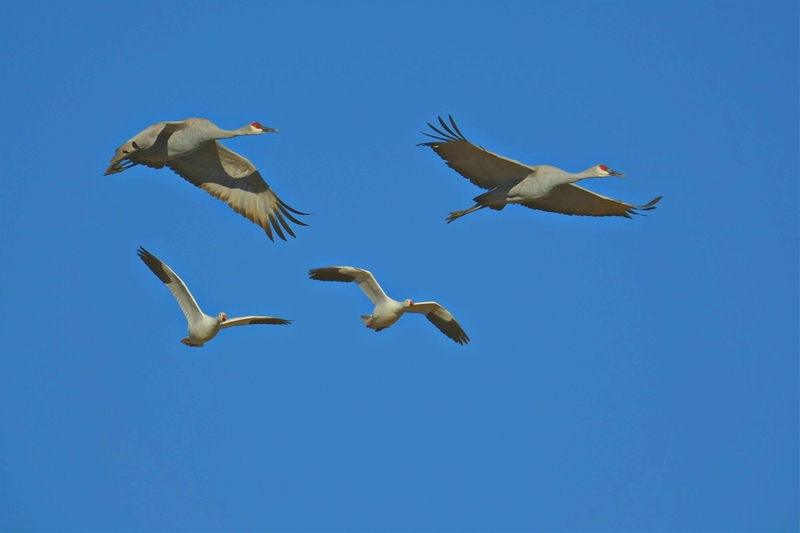 The Sandhill Cranes and Snow Geese are always doing something. These two cranes are having a dispute over…well, it is hard to say. 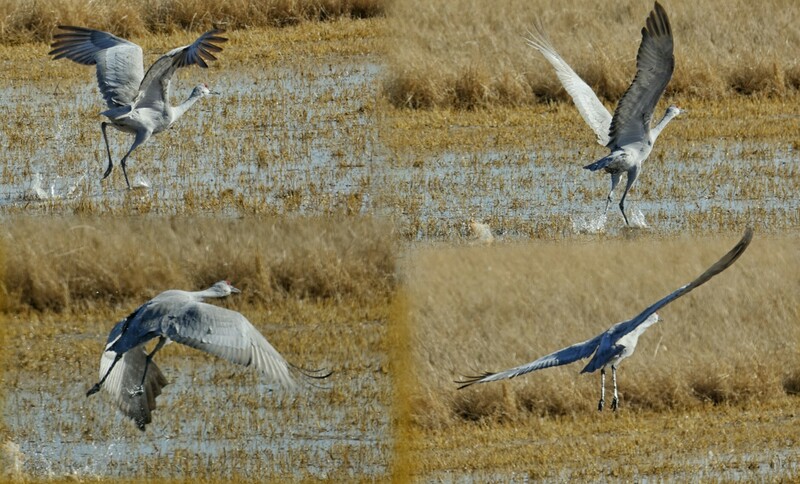 This group of cranes had a lot of this kind of action while I was watching but I never could determine the cause. This is two adults. 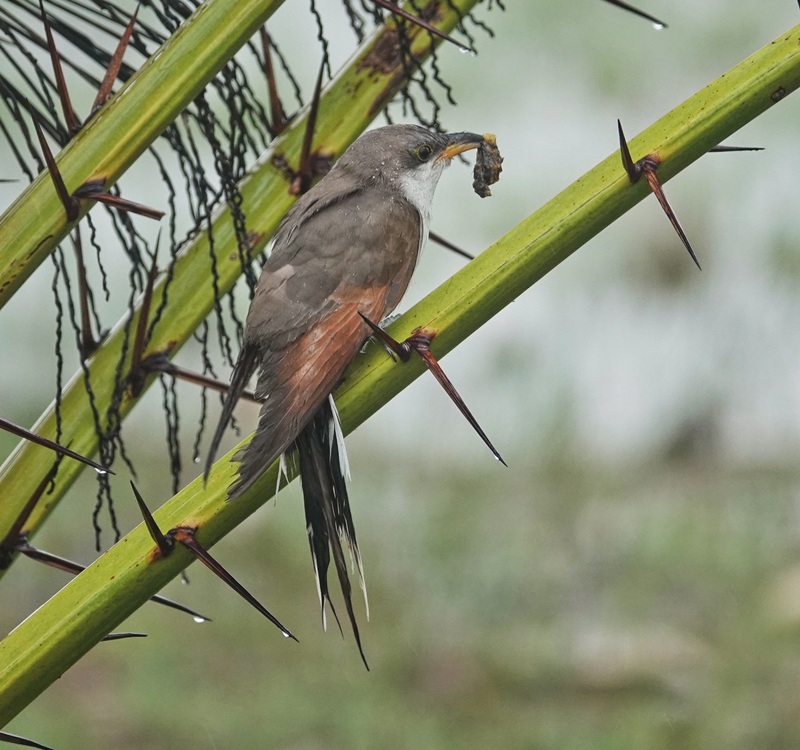 It is not breeding season. Who knows what was going on, but it makes a dynamic image. Sony RX10iii at 600mm equivalent field of view. Program Mode with continuous focus. Processed in PhotoShop Express on my Android tablet. Sony RX10iii at 600mm equivalent field of view. Program Mode (my saved Birds in Flight Mode…with wide area and continuous focus, and minimum shutter speed ISO set). Processed in Photo Mate3 on my Android tablet. 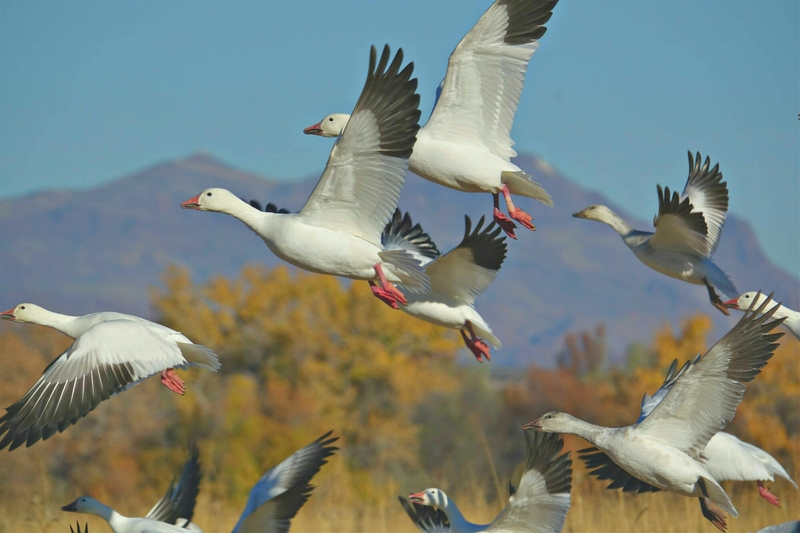 Though it is the Festival of the Cranes at Bosque del Apache NWR near Socorro New Mexico, it is probably the Snow Geese that keep people coming back. Standing beside a field of Geese when they startle and rise all at once is an experience that inspires wonder and delight in almost everyone who sees it. The Geese are beautiful. The action is spectacular. The sound of the calls and the wings is overwhelming. The energy is undeniable. Once experienced it wakens the appetite for more. I talked to one couple, originally from Cincinnati Ohio, who moved to Albuquerque in part because of their experience at Bosque del Apache. It is that impressive. Impressive enough to change the course of a life. And of course, the generous eye is always looking for experiences like the Geese rising…life-changing experiences. Experiences that speak directly to the spirit in us…and speaks the greatness of the Spirit that creates all in love. Awe inspiring experiences. If your eye is generous you will find them everywhere. Bosque del Apache is just a very obvious, and accessible, example. So, happy Sunday, and may you find your Geese rising experience today! It just may change your life. One of the most popular activities at the Festival of the Cranes at Bosque del Apache National Wildlife Refuge is, believe it or not, to get up at 4am to be at the Refuge in time to stand in the cold beside a body of water in the dark and wait for the sunrise. 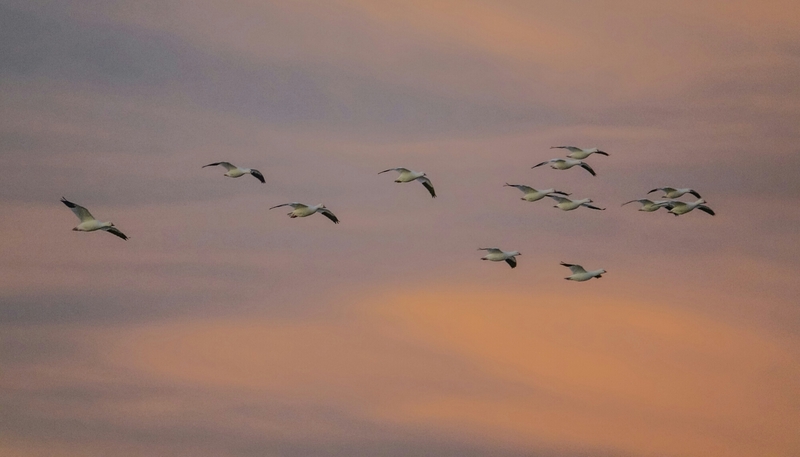 Generally, if you have picked your spot correctly, just before the sun crests the horizon, the Snow Geese will rise from the water and fly off to feed in fields deeper in the Refuge, followed shortly but the Sandhill Cranes. Seeing the Geese and Cranes rise in the dawn light is what brings the folks out that early, and it is indeed an experience not to be missed. I do it once at least on each visit. 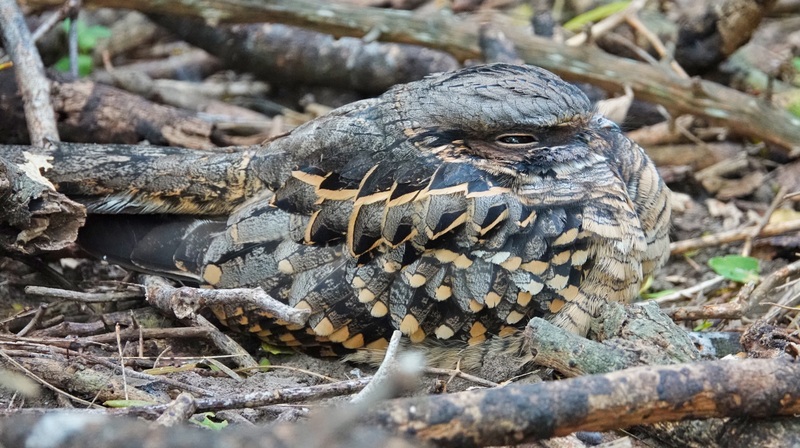 Yesterday I actually taught a workshop and had 4 other intrepid souls with cameras beside me at the pond in the dark, and were amply rewarded. This is a small flock of Snow (and Ross’) Geese moving just as the first light came into the sky. Sony RX10iii. Program Mode. Processed in PhotoShop Express on my Android tablet.